Before I get into today's post I want to spread the news. In case you missed the commercials this week, today, Thursday, November 17, through Sunday, November 20, Starbucks is offering buy-1-get-1 free holiday drinks from 2pm to 5pm. Go get yourself a caramel brulee. SO good. The way people go crazy for PSLs, I got crazy for the brulees! 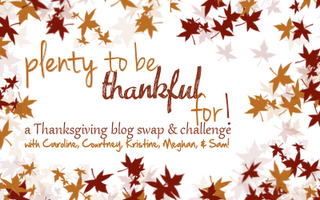 Today's topic for the Plenty to Be THANKful For blog challenge: I love the blogosphere. Such an easy topic to blog about! It's true, I do love the blogosphere. The main reason? You! Yes, you. Every single person who reads my blog is so important to me. In fact, I've made some pretty incredible relationships via this blog. I've had the amazing opportunity to meet several bloggers in person who I proudly call my real life friends now. And there is a bunch of others who unfortunately live far away and I have yet to meet. Thank God for emails and tweets so we can stay connected from different parts of the country, and world! Here's a big virtual thank you for being so amazing! Next month marks my five year blogging mark. That's pretty huge for me and I plan on celebrating with a big giveaway. It's my way of saying thank you for all of your support. Stay tuned! I loooove the blog world :) And so glad to have met you through it!! Love those tulips!! I feel like I'm obsessed with them lately. Probably just because I'm wishing for Spring already. I'm a chicken when it comes to cold weather. Blogging is the best :) And we, your readers, are thankful for you! 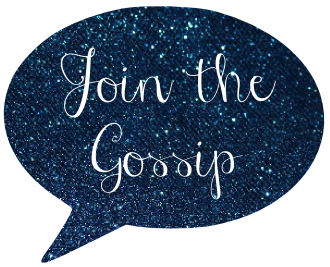 I'm so thankful for the blogosphere too--I linked up today. :) And I'm gonna try a caramel brulee latte thanks to you! Oh, how sweet! I'm thankful for my blog buddies as well. I saw that Starbucks promo in the elevator just now. So nice! Wow - thanks for the Starbucks tip! I've only been blogging a short time and am already thankful for the connections I've made. I'm thankful for peppermint mochas today, I enjoy the brûlée too! I feel the blog love. Thanks for linking up! Umm THANK YYOOOUUUUU for letting me know about Starbucks! Congrats on almost 5 years and here's to 5 more. You are AH-mazing and so is your blog! P.S. Thanks for the heads up on Starbucks. I'm definitely going there for a warm and toasty beverage this weekend. I've never tried the caramel brulee and need to try it stat. I absolutely adore my blog friends! The blogosphere sure does rock!! So many amazing and talented women to talk to, be inspired by and learn from everyday! !